Portrait of Andrew Horatio Reeder, 1807-1864, who was the first governor of Kansas Territory. In 1855, Reeder was removed from office by President Pierce and forced to leave Kansas when threatened with arrest for a charge of high treason issued by a pro-slavery grand jury. He escaped with the help of Thomas and Julia Stinson, who dressed him in women's clothing. 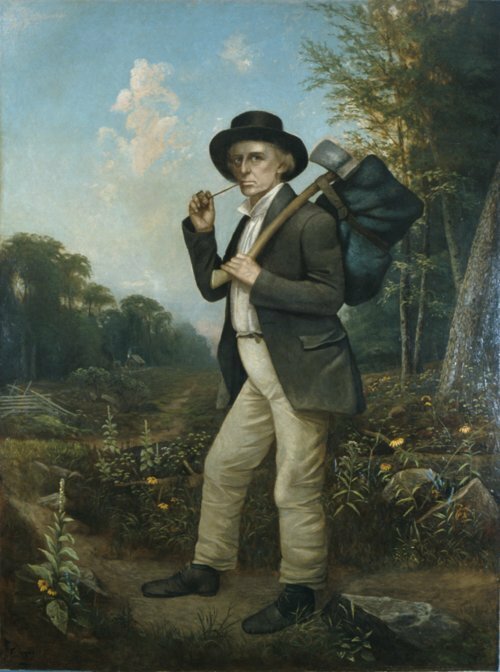 In May 1856, Reeder disguised himself as a woodcutter (as depicted in this painting) and escaped via a steamboat on the Missouri River. Artist Cyrenius Hall painted this portrait in 1880.